When Should A Property Owner Hire Residential Property Manager? One of the biggest decisions you will ever make as a property owner or a landlord is whether you should hire a residential property management company or not. As a landlord, having rental properties will help you to generate additional income but they can also be a great deal of work. Many property owners or landlords prefer to manage their properties on their own in order to save a few dollars. But sometimes there are instances when the property owners require professional help to manage their multiple properties and thatâ&#x20AC;&#x2122;s when a property management company make sense. 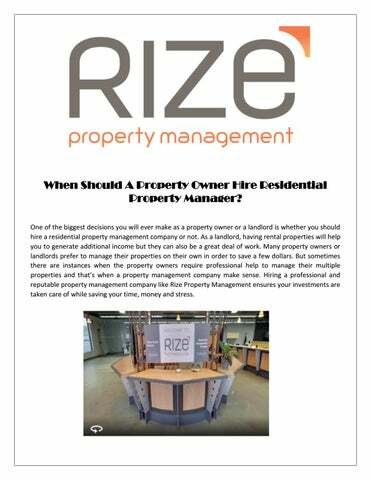 Hiring a professional and reputable property management company like Rize Property Management ensures your investments are taken care of while saving your time, money and stress.